Poems, riddles, and superheroes, oh my! Are we talking about math? May is here and I have several books to keep that child or student of yours engaged these last few weeks of school and into the summer. K.13A Identify mathematics in everyday situations. 2.12A Identify the mathematics in everyday situations. 5.14A Identify the mathematics in everyday situations. K.13B Solve problems with guidance that incorporates the processes of understanding the problem, making a plan, carrying out the plan, and evaluating the solution for reasonableness. 2.12B Solve problems with guidance that incorporates the processes of understanding the problem, making a plan, carrying out the plan, and evaluating the solution for reasonableness. 5.14B Solve problems that incorporate understanding the problem, making a plan, carrying out the plan, and evaluating the solution for reasonableness. K.13C Select or develop an appropriate problem-solving strategy including drawing a picture, looking for a pattern, that incorporates the processes of understanding the problem, making a plan, carrying out the plan, and evaluating the solution for reasonableness. 2.12C Select or develop an appropriate problem-solving plan or strategy including drawing a picture, looking for a pattern, systematic guessing and checking, or acting it out in order to solve a problem. 5.14C Select or develop an appropriate problem-solving plan or strategy, including drawing a picture, looking for a pattern, systematic guessing and checking, acting it out, making a table, working a simpler problem, or working backwards to solve a problem. K.13D Use tools such as real objects manipulatives, and technology to solve problems. 2.12D Use tools such as real objects, manipulatives, and technology to solve problems. 5.14D Use tools such as real objects, manipulatives, and technology to solve problems. K.14A Communicate mathematical ideas using objects, words, pictures, numbers and technology. 2.13A Explain and record observations using objects, words, pictures, numbers, and technology. 5.15A Explain and record observations using objects, words, pictures, numbers, and technology. K.14B Relate everyday language to mathematical language and symbols. 2.13B Relate informal language to mathematical language and symbols. 5.15B Relate informal language to mathematical language and symbols. K.15 Justify his or her thinking using objects, words, pictures, numbers, and technology. 2.14 Justify his or her thinking using objects, words, pictures, numbers, and technology. 5.16B Justify why an answer is reasonable and explain the solution process. 5.16A Make generalizations from patterns or sets of examples and nonexamples. I’ve highlighted the few differences. Obviously the difficulty of problems increases each year, but the bottom line is the same: Your child needs to know how to confidently UNDERSTAND a problem, make a PLAN, and SOLVE it using an appropriate strategy that includes checking for reasonableness. Kindergartners love to count on their fingers, or count by ones to solve a problem. It’s necessary, and even cute, because they haven’t learned many other strategies yet. But when your 5th grader, who HAS learned a variety of strategies, counts on her fingers (under the desk to remain unseen, of course), it’s more worrisome than cute. But the reality is this is actually quite common when we teach strategies, but don’t give kids PRACTICE, PRACTICE, PRACTICE in school and at home to get comfortable with these other ways of thinking. They’re just more comfortable with their trusty, tried-and-true fingers. Fingers aren’t the only culprit, lest you thought you were off the hook. I’ve also seen kids grab onto other strategies like tally marks, for example. “Sue has 16 cupcakes. John has 10. How many cupcakes do they have altogether?” So a student draws out 26 tally marks and tries to count each one, maybe accidentally double-counting a tally, maybe not. But when they do this with the numbers 62 and 16, your mouth drops as a teacher. “Why didn’t he draw base ten blocks at least, or use a number sentence?” we think to ourselves, feeling a sense of defeat. Once kids learn a strategy that makes sense (counting on fingers, or maybe a step beyond that like tally marks) they try to apply THAT SAME strategy to fit any and every problem after that. And this simply won’t work. They must have a tool belt full of a variety of strategies, understand which kind of problem calls for which types of possible strategies, and then have the confidence to actually choose and use a reasonable one. If this all sounds a little overwhelming to you, don’t worry. Math is all around your child in everyday situations. As a parent, you can use these teachable moments with just a little help from a great author and mathematician. I’ve broken down two of his books for you, so you can decide which book is best for your child. This is also a great gift idea for your child’s teacher because we are always looking for engaging ways to bring the real world of math into our classrooms. 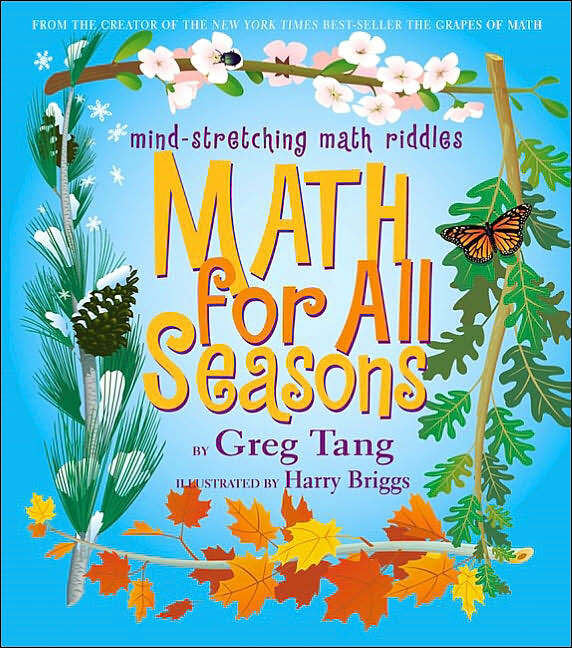 Teaches problem solving through math poems and illustrations. Aims to transition kids from counting to arithmetic. Challenges them to think through problems and see multiple strategies. This critical thinking and ability to see a variety of strategies is expected in school as early as kindergarten. 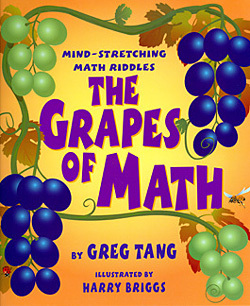 Topics:Using math riddles, each page presents an everyday math situation that needs a solution. But mathematicians are often given a warning: “Please don’t count them, it’s too slow, this hot pie was made to go. ” or hint to guide them to see differently: “Instead of seeing groups of threes, count by fives and it’s a breeze.”Strategies taught:multiply and then subtract or add (multi step), find convenient sums, multiplication as fast addition by grouping, making tens, organize info by looking for patterns and symmetry. It also introduces great vocabulary for this age group. To find one answer, you much “look askew”. For many ages it’s tempting to count one-by-one. Don’t be so surprised to see your 5thgrader counting a group of objects this way. Sometimes they just lack the confidence to try a different way. My dad always said “Work smarter, not harder.” This book aims to get students comfortable with a variety of strategies that they’ve probably already been taught, but have little experience using in real world situations. As their confidence soars, they’ll learn how to apply these to other situations. Topics:Using poems about annual events in the life a child, each page presents an everyday math situation that needs a solution. Within each poem, the author provides a challenge to see things differently. When presented with 3 rows of 3 chicken eggs, the question is “How many have hatched?” Left alone, a child will often choose to count one at a time, even when other strategies have been taught in school. This poem provides the scaffolding for the strategy “subtract to add” by saying “to quickly count this chirping batch, subtract the one that’s yet to hatch” (3,6,9, minus the 1 hatched egg = 8).Strategies taught:Smarter ways to group like making tens or skip counting, doubling, subtract to add, spot patterns and symmetries, think creatively. Answer key in back explains the smarter way to group versus just counting. With small amounts, kids would rather count. But as amounts get larger, this is a disaster. Learn smarter strategies using this book and they’ll be on their way to bigger and better things in no time! To the classroom teacher:I’d introduce one poem (problem) a month on chart paper and have students share their strategies with the class. My students gained the confidence to try a different strategy when they saw a classmate try it and heard them explain their thinking. The poems fit nicely with various holidays and special events each month such as spring and new life, rainy April, Easter, summer ice cream, spring butterflies metamorphosis, cutting grass, fireworks in July, maize/corn in field, acorns, Halloween, fall leaves change, snowflakes, snowmen, holiday presents and gingerbread, new year. Next up… Zero the Hero. Unlike most numbers, Zero believed himself to be a hero. He just needed a chance to prove it. But Zero’s belief in himself didn’t count for much when it came to fitting in. Find out how this mathematical Rudolph-like story can hook your child and enhance his or her learning in my next post. Great observation! This is so common and I even know of adults who will revert to this on occasion, especially if they’re tired or under a time pressure. Yeah I’ll have to check these out. We also did some intense math with addition and subtraction wrap ups. Michael already knew how to add and subtract 2 and 3 digit numbers but I wanted him to memorize the tables. So the wraps ups helped him alot. He’s not counting on his fingers for smaller numbers. He automatically knows 3 plus 3 is 6. But some of the higher numbers still give him issues. I love those wrap-ups! I had those in my classroom, too. These 2 books focus on real-life problem solving versus fact family memorization. Both have their place for sure, but I like how the poems and riddles use the smaller number examples to ease a child into success with some fabulous critical thinking skills. So even if Michael would easily “know” the answer to the poem’s algorithm, you could challenge him to “see it differently” the way the poem suggests. This will prove invaluable as the numbers get larger. It’s kind of like those optical illusions of the rabbit/duck and skull/woman!